In White Plains, dark hardwood flooring is very stylish. Many of my customers love the dark look…they even ask for Ebony. 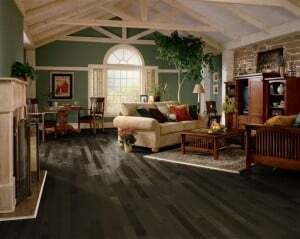 Dark is sleek and stylish and gives your Rhode Island home a sophisticated look. How do you get dark hardwood floors? What options are there? Most dark hardwoods are stained to make them darker. There are many types of woods that can work. 1. The most common dark flooring is oak hardwood that is stained with a dark brown stain such as Ebony (the darkest stain) or a slightly lighter with a Jacobean or Dark Walnut stain. Many customers who are seeking a dark stain want “pure” brown with no hints of red. And, these 3 stains seem to achieve that goal well. The above 2 pictures are ebony. Even if you have red oak flooring, these dark stains will drown out the inherent redness of the wood. If you already have oak floors, your floors can be stained dark (even if they are currently light colored). Or, if you are adding hardwood, you can either get a prefinished oak with a dark stain, or you can get unfinished hardwood and sand and stain it on the site. (One of the benefits to refinishing it on site is that you can test samples of it on your own wood before committing to a color). On the right is a picture of some of the minwax stain samples – Jacobean, ebony, red mahogany and dark walnut. It’s important to test the colors on your actual wood as they often look different on different woods. Also, looking at the Jacobean and Dark walnut on this chart, I can tell you that these actually tend to look much darker in real life on the real wood. So, always test. 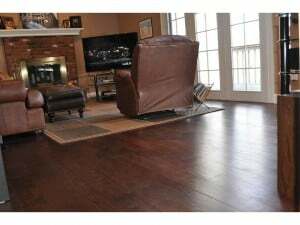 Some customers want dark floors, but they also want a bit more warmth in the color, and in those cases, often Royal Mahogany is a good stain selection. It appears to be a combo of ebony and red mahogany. Oak hardwood flooring tends to be less expensive vs other hardwood species as it’s more abundant here in the US. 2. Brazilian Walnut is naturally a darker wood. In its natural state, I would call Brazilian Walnut a mid toned brown. Brazilian Walnut has a richer smoother grain vs. oak and it has a lot more color variation. You also have the option to add a stain to Brazilian Walnut to make it darker. 3. 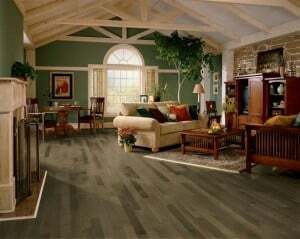 Hickory flooring is another hardwood that can easily be stained darker. Hickory is harder than oak (1800 on the Janka Scale vs. 1290 for red oak). The above hardwoods (oak, brazilian walnut or hickory) are easy to install either as prefinished or unfinished hardwood and then stained on site to the desired color. The following hardwoods are generally best to get prefinished, especially for darker stain colors. (These woods are either rare/expensive to get in an unfinished form and/or are challenging to stain on site as they come out blotchy. 4. Maple hardwood flooring can be stained dark. Maple is a challenging hardwood to stain due to its pores; some of the dark stains come out gray and some come out darker brown. If you want a dark maple, I’d recommend buying a prefinished maple. 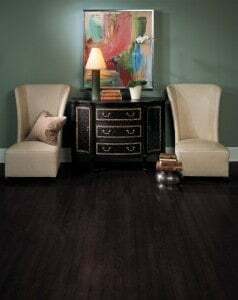 Shaw’s Cosmopolitan maple is a unique black hardwood with a special type of enamel. It has a very sleek and modern look. But, it is a distressed hardwood, so it’s not a flat surface like most hardwoods that you find in White Plains. 5. Some prefinished birches (left) and ashes (right) come very dark…even darker than maple. 6. Wenge is a very dark hardwood and has its own unique look. It tends to be on the more expensive side. Unfortunately I don’t have a picture of real Wenge hardwood, but the picture to the right is a laminate version of Wenge. If you live in White Plains and would like more advice on refinishing hardwood floors or installing new hardwood floors, feel free to give The Flooring Girl a call at 914-937-2950.